In the Midwest, the word “hydrology” is often incorrectly used to refer to surface water alone. Hydrology is the study of all waters. This includes surface-water bodies such as wetlands, creeks and ponds; ground water such as that pumped from wells or discharging from seeps and springs; water falling as rain or snow, evaporating from the land, and used by plants. The hydrologic cycle is complex. Consequently, solving problems dealing with water commonly necessitates study of a wide variety of factors, large areas, and long periods of time. 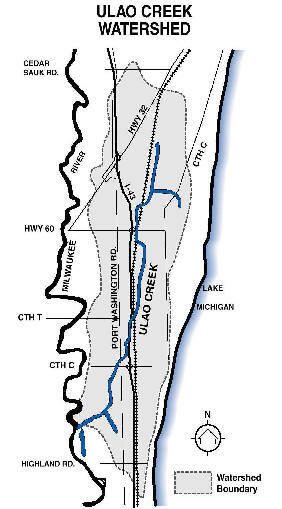 Where does Ulao Creek’s Water Come From? Simple question … not so simple answer. Even though intermittent creeks flow into the Ulao Swamp, Ulao Creek is usually defined as a perennial stream flowing out of the south end of the Ulao Swamp. Perennial streams continue to flow year round, but can occasionally go dry during periods of extreme drought. In contrast, intermittent streams are normally dry, flowing only in response to intense precipitation and snowmelt. The portion of the creek’s flow that is not derived from immediate surface runoff is called “baseflow.” Ulao Creek’s baseflow is derived primarily from springs and seeps in the western half of the Ulao Swamp. The Creek’s baseflow is modest (e.g., 100 gallons per minute or less in the summer), but is critical to aquatic life. Without this sustained source of water, the creek dries out and aquatic organisms perish, migrate, or become dormant. Baseflow is not a concern in regard to flooding problems. Flooding in the watershed is caused by surface-water runoff. Clayey soils and increasingly urban land uses cause storm and melt water to quickly flush to streams. This water is usually heavily laden with sediment and nutrients and can damage the creek’s biota and morphology. Storm-water management practices such as detention ponds are designed to help buffer the creek from these intense surges of water, nutrients, and sediment. What Does Geology Have to Do with Ulao Creek and Ulao Swamp? Sediments underlying the watershed are composed of a complexly interlayered sequence of sand, silt, clay, and some gravel. The thickness and extent of these layers dramatically affects the way precipitation infiltrates into the ground or runs off the land, and the direction and velocity of ground-water flow. To summarize in a very small nutshell, most of the Ulao Creek watershed is underlain by fairly impermeable clay, a sediment impeding infiltration and ground-water discharge. Modest-sized areas are underlain by permeable sand and gravel, sediment conducive to surface-water infiltration and ground-water discharge. These areas are important to allow stormwater to infiltrate, attenuating flood flows. This same water raises water tables and helps provide clean, cool baseflow to the creek in times of drought. Those same conditions are favorable to springs and seeps, the features that sustain Ulao Creek’s flow during dry weather. Higher than normal water levels in the Ulao Swamp. In response to these concerns, the Hydrology Study Group set three goals to help maintain/restore Ulao Creek to a more healthy perennial stream – a stream suitable for providing nursery areas for migratory cool water game fish and other important organisms. Stabilizing or increasing dry weather baseflow for the benefit of aquatic and riparian plants and animals. Although work on these goals has barely begun, the group has identified one concern that may help promote these goals. The Ulao Swamp was historically a forested wetland, an area occupied by water loving trees such as silver maple, elm, and green ash. While the swamp could be flooded for weeks on end, it usually dried out during summer. Since the 1970s, year-round flooding has become increasing common in the swamp. These conditions have caused much of the forest to die (take a look from Ulao Parkway some time). The group discussed what changes occurred to cause this to happen and toured the creek upstream of Ulao Road. Two significant disruptive events occurred during the late 1960s and early to mid 1970s: the die-off of large tracts of American elm due to Dutch elm disease, and extensive damage to trees caused by a severe ice storm. Both of these events contributed inordinately heavy loads of woody debris to the forest floor. Much of this debris fell directly into the creek channel or floated to the channel during higher water periods. The large tangle of fallen wood created log and brush jams that, in turn, caught sediment and other debris. The large amount of woody debris was very evident during the tour of the creek. The natural “dam” created by the wood, debris, and silt caused water levels in the swamp to rise. Rising water levels killed more trees, causing another heavy load of woody debris to accumulate and thus causing water levels to rise even further. This cycle appears to be continuing with the decline of trees in ever larger areas of the swamp. The Hydrology Study Group studied the morphology of the creek and found that large volumes of soft sediment were trapped by piles of partially buried woody debris in many areas. A long-time resident of the area stated that the creek was much deeper in the late 1960s. With this in mind, the group believes that the excessive woody debris deposited in the creek beginning during the 1970s caused the stream channel to aggrade, raising the elevation of the swamp’s discharge point, in turn raising water levels in the swamp. If the excessive woody debris would be cleared from the creek channel, natural processes would, over time, return the stream bed to a more natural lower elevation. This in turn would lower dry weather water elevations in the swamp and would increase dry weather flow in Ulao Creek. Lower water levels also would allow lowland hardwoods to survive and recolonize areas presently flooded for most of the year. Members of the group are conducting a small scale experiment on this approach in a debris choked area just downstream of Ulao Swamp. Excessive woody debris that formerly lay across the channel was moved by hand to lay parallel with the stream banks. Stream bottom cross sections were measured and will be re-measured at a later date to determine if natural processes have caused the channel to deepen. We’ll tell you more in a future issue of the newsletter.